Arrow Farmquip manufacture a wide range of cattle and sheep handling equipment. They supply these products to the Australian agriculture and farming industries. One of the most improved releases has been the Q-Catch 200 Series Cattle Crush. Arrow Farmquip have been designing and manufacturing cattle handling equipment for over 20 years. Arrow Farmquip pride themselves on being a family owned Australian business who are committed to providing the livestock industry with the latest in innovative design, high quality manufacture and complete technical support and backup for their entire product range. Arrow Farmquip’s range of Cattle Crushes has evolved over a number of years of intense research and development. These Cattle Crushes are carefully engineered to give you the best possible equipment at the best possible price. The 200 series Q-CATCH Cattle Crush makes a good, well respected crush even better. Arrow Farmquip's design team have travelled the world looking for new ideas and concepts and has affiliated manufacturers in North America, Argentina and New Zealand. 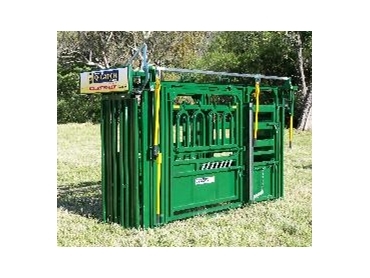 The Q-Catch range of Cattle Crushes offers reliable, efficient and trouble free operation. Safety features of the design also help the cattle producer with OH&S compliancy as well as making every day livestock handling a safer, simpler task. Teamed with a new innovative, hi-tech silent locking mechanism allowing an easy push - pull operation. Unique dual headbail locking system - doors lock on the door not through a linkage. A unique mechanism holds under the jaw, both sides and top of the neck.